The Trump administration “wants to arm the police like they’re fighting a war,” said Sarah Posner in The Washington Post. Attorney General Jeff Sessions last week said Trump would rescind an Obama-era ban on the federal government’s sale of surplus military equipment to local law enforcement—“weaponized vehicles, high-caliber firearms and ammunition, grenade launchers, bayonets.” President Obama barred these transfers after the militarized police response to the rioting in Ferguson, Mo.—a reaction to the police shooting of an unarmed black man—arguing it made local cops look and act like “an occupying force” in enemy territory. Now Trump has revived the program—right on the heels of his appalling response to white-supremacist violence in Charlottesville, Va., and egregious pardon of former Arizona sheriff Joe Arpaio, a serial abuser of constitutional rights. At a time of racial strife, Trump has fanned the flames, distributing weaponry intended for the battlefield. 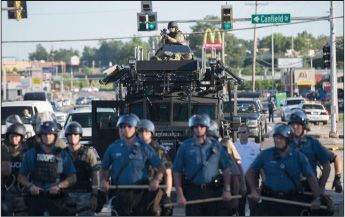 This is a war—“a war on the police,” said Alfred Regnery in USA Today. The number of on-duty cops killed by a firearm “increased 56 percent during 2016” over 2015. Meanwhile, two studies by researchers in Europe and at the University of Tennessee show military equipment “reduces crime, reduces assaults on police, and increases arrest rates for major crimes such as use of deadly weapons and drug trafficking.” The vast majority of military equipment provided to the police, such as body armor, “is purely defensive,” said John Lott in FoxNews.com. “Still, even the more extremesounding weapons” have important uses. Flashbang grenades— which are designed to disorient, not kill—“may be the safest option to immobilize criminals before police enter.” Sniper rifles can “save innocent lives” in a hostage situation.